When someone does something so kind that you feel it's golden, send them a rich and elegant card that is sure to make them know how much you appreciate them. This pretty card is an elegant way to show someone how they make your life rich!! A hand-stamped card with luxurious gold accents is a wonderful way to show that you care. 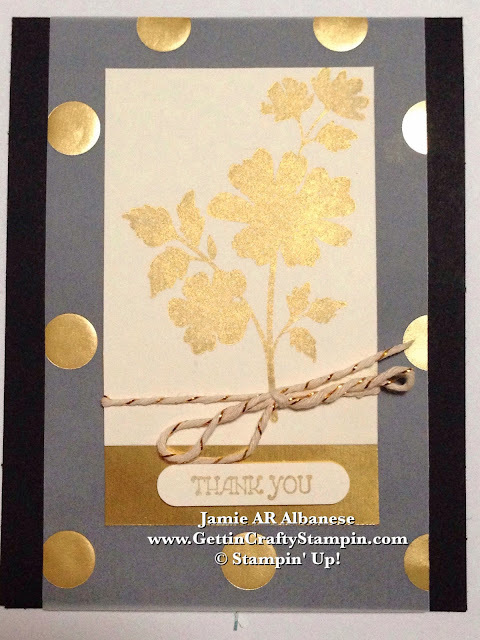 Layer this Gold Designer Vellum sheets over the Basic Black card stock. I used the Glue Dots under the Gold Polka Dots for a hidden adhesive. Layer a piece of the Gold Foil Sheet at the bottom. Stamp the 'Thank You' from the Gifts of Kindness set and punch out with the Word Window punch. 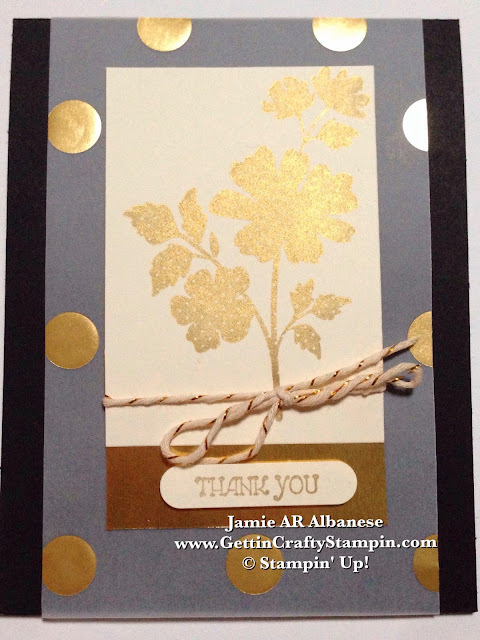 Layer over the Gold Foil Sheet with Stampin' Dimensional Adhesive. Add an inner Liner to the Basic Black card with a Very Vanilla piece. This gives an easy place to write and an elegant presentation. Wrap this Gold Baker's Twine around the flower and tie into a bow. I love the Metallic Baker's twine - see this video on a cool tip on how to use it an not un-ravel. (Raise the sentiment with our Stampin' Dimensional adhesive. I hope that you liked my YouTube channel! Follow Me Here!! Celebrate and Thank those who make your life richer... this elegant and golden hand-stamped card is a lovely way to say 'Thank You'. I love the fashion forward metallic accents offered in our New Idea Book and Catalog. The golden rule, treat others as you'd want them to treat you, gives this card an extra special 'thanks' for all that they did to bless you.